Visual Studio Code>Linters>vscode-phpstanNew to Visual Studio Code? Get it now. PHPStan is a static analysis tool for PHP. This extension integrates the output of PHPStan in VSCode allowing the developer to find errors quicker. PHPStan is required to use this extension. By default the plugin will search the global vendor folder and the workspace vendor folders. The COMPOSER_HOME environment variable can be set to change where the plugin searches. This path can be manually set using the phpstan.path setting. 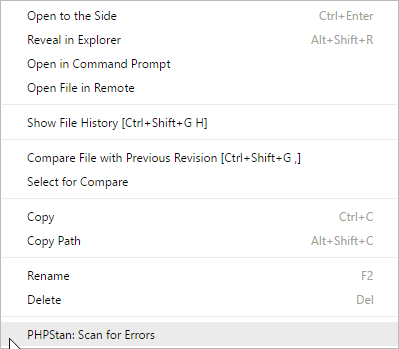 PHPStan includes an explorer-context command called "PHPStan: Scan for Errors". This command works on both directories and files. <workspacefolder>/phpstan.neon and <workspacefolder>/phpstan.neon.dist will be used when phpstan.projectFile is set to null. phpstan.options can be used to pass extra parameters to the phpstan commandline call.